APRIL 2007 -- Well, here we are again. When this reaches you hopefully the cold, cold winds have changed to warm breezes and the flowers have started to come up. 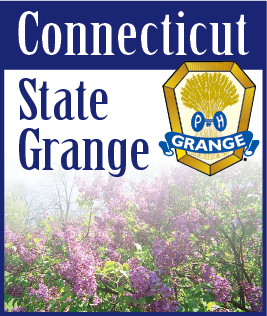 On June 10th the Junior Grange committee will have the judging of the Regional Contest. That contest is to Decorate a Picture Frame. You are to decorate a 5”x7” store bought, handmade frame or mat. It should include a picture. The picture will not be judged. There is to be NO GLASS in the frame. Use any type of foam, bead, puzzle pieces, shells, glitter, etc. Age categories are: 5-7, 8-10, 11-14 as of January 1, 2007. Each first prize winner will receive 3 tickets for the “Big E” and one parking pass. I hope there will be many entries. Remember you can’t win if you don’t enter.